When I was a little kid, sweetened condensed milk was one of my favorite things. If I was sick and needed a spoonful of cough syrup to get me by, my mother would promise me a spoonful of sweetened condensed milk afterwards to help get rid of the taste. Even when I was sick, I recognized that this was a treat. Instead of her promised spoonful, I would ask for several, claiming the gross taste of cherry cough syrup was still in my mouth. My mother would just smile knowingly. When I was feeling better, I would later break into our pantry, trying to figure out where my mother kept the cans of sweetened condensed milk. Always on the top shelf, of course. The only thing that really stopped my 7-year-old self from devouring an entire can was the fact that I didn't know how to operate a can opener. It wasn't until fairly recently that I remembered sweetened condensed milk even existed in the first place. When tasked with baking a key lime pie for my coworker's sister's boyfriend's birthday (quite the connection, I know! ), the recipe called for a can of sweetened condensed milk. It was only then that I remembered how much I loved the stuff. After emptying the majority of the can's contents into the pie filling, I found myself using a rubber spatula to scrape the remains of the can and lick it clean. Turns out old habits die hard. That's right. Sweetened condensed milk cake. It's like my two favorite things coming together — sweetened condensed milk AND cake — to have the beautiful baby that you see above. I've had my eye on this recipe for a while now. I was interested in it not only because it combined two of my favorite things, but also because its recipe was structurally interesting. 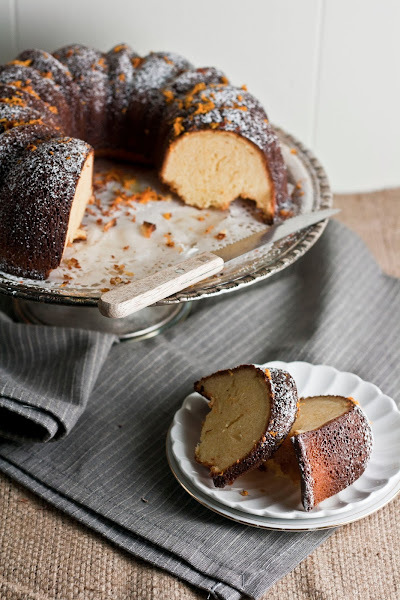 Instead of using sugar to sweeten the cake, the recipe uses two cans of sweetened condensed milk. How would it taste? You would expect a cake that uses two cans of sweetened condensed milk to be extraordinarily sweet, but this cake wasn't. At all. If anything, it was less sweet than other cakes I've made in the past. Its main flavor instead came from the eggs, which was unsurprising — there were 8 eggs in the recipe after all. I was pleasantly surprised. I'm a big fan of eggy pound cakes. The cake was also denser than I thought. I was expecting a light and fluffy cake, but this was a hearty beast. 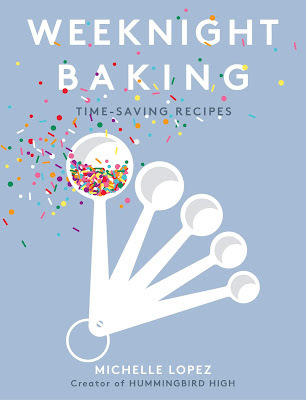 In retrospect, this makes a lot of sense — creaming eggs and sugar together creates air bubbles that give cakes their light and airy texture. 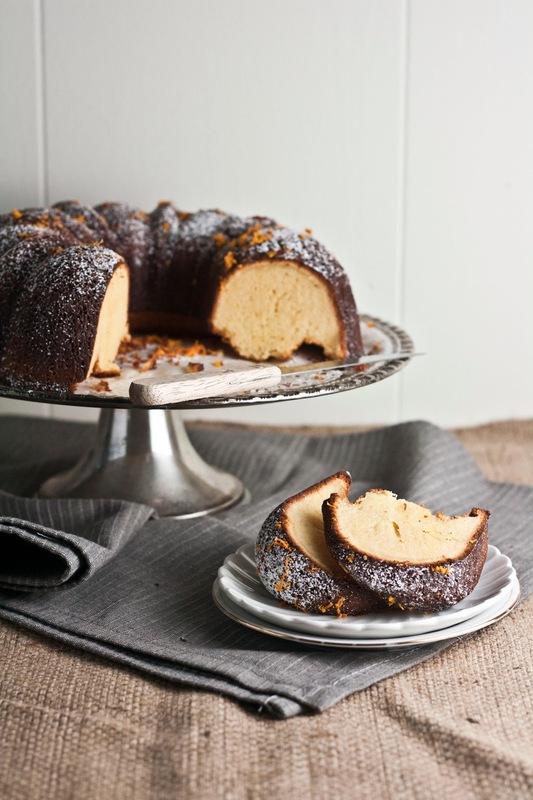 Therefore, replacing sugar with a heavy liquid like sweetened condensed milk results in a dense cake since you won't have additional leavening from the creaming process. Preheat the oven to 350 (F). 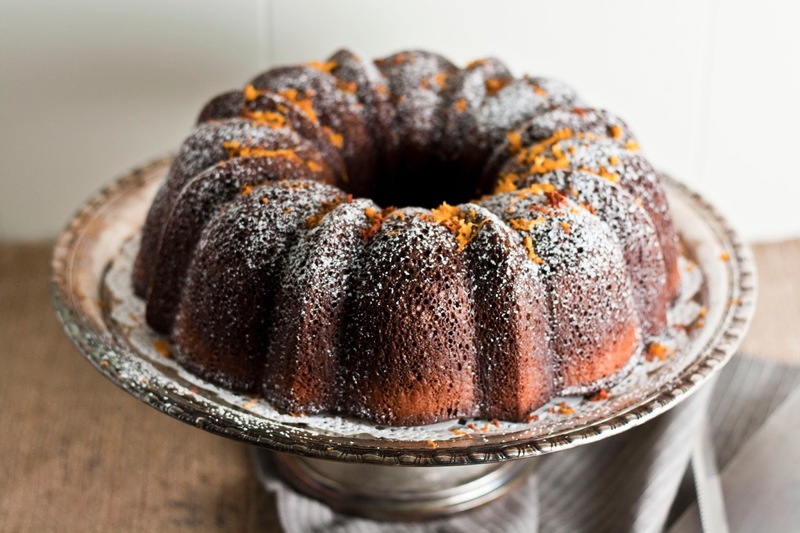 Prepare your bundt pan by either generously spraying with cooking spray or brushing with 1 tablespoon melted butter. Dust generously with flour and flip and tap to remove excess flour. In a small pot, melt 1 stick unsalted butter with 1 teaspoon orange zest over medium heat, continually stirring with a heatproof rubber spatula to prevent the butter from burning and help infuse it with orange flavor. Set aside to cool. In the bowl of a freestanding electric mixer with a whisk attachment, whisk together 8 eggs until well beaten. Pour in 2 cans of sweetened condensed milk and whisk until well combined. The mixture should be pale yellow and smooth. Add butter and orange zest mixture (from the second step), and continue whisking until well combined. Once the butter has been incorporated into the milk and eggs, turn the mixer off and replace your whisk attachment with a paddle attachment. In a small bowl, whisk together 2 cups flour, 1 teaspoon baking powder, and 1/4 teaspoon salt. Sprinkle over the liquid mixture (from the third step), and turn on your mixer to the lowest speed, mixing the ingredients together until just incorporated. 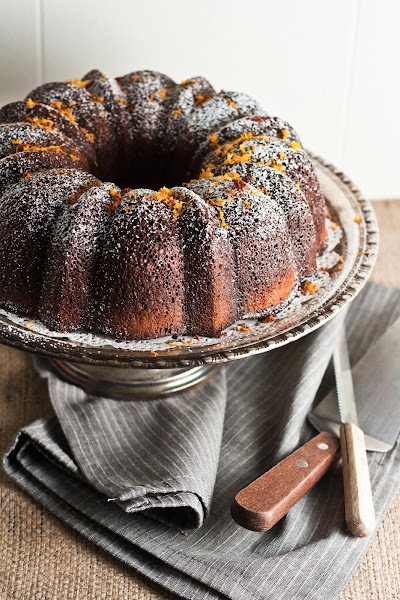 Once the dry ingredients have been incorporated into the liquid ingredients, pour into the greased bundt pan and bake for about 60 minutes — a skewer inserted into the center of the cake should come out completely dry. When the cake is finished, let the cake cool in its panon a cooling rack completely. 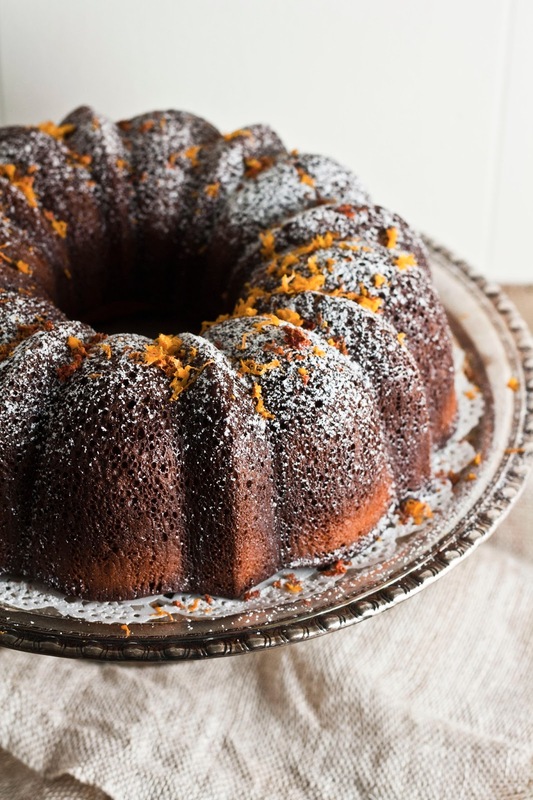 While the cake is in the oven, make the Grand Marnier cake soak. Combine 1/2 cup water, 1 tablespoon vanilla, 1/4 cup sugar, 2 tablespoons unsalted butter and a pinch of salt in a small pot. Cook over low heat (do not boil! ), whisking frequently until the sugar is dissolved and the vanilla is fragrant, about 10 minutes. Once the sugar has dissolved, remove pot from heat and let the mixture cool to room temperature. Once the mixture has cooled, whisk in 1/2 cup Grand Marnier. 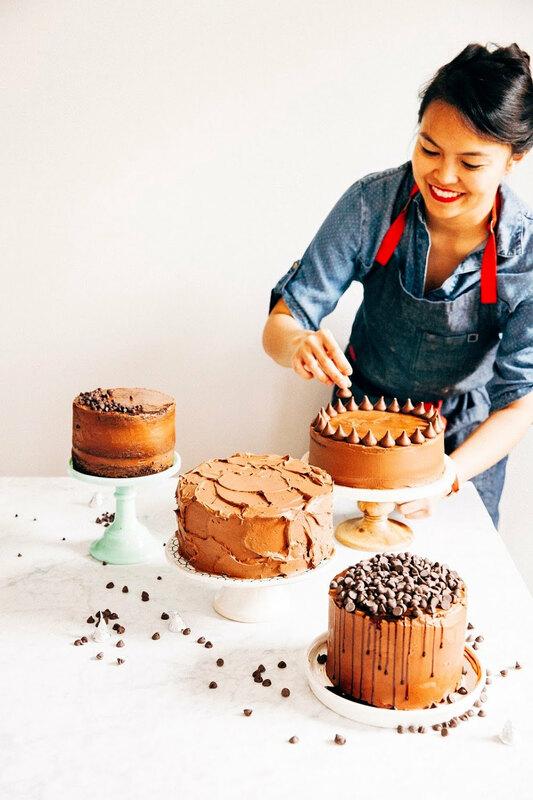 Once the cake has cooled in its pan completely, use a wooden skewer to poke holes all over the exposed part of the cake (this will be the bottom of the cake once inverted into a plate). Pour the Grand Marnier cake soak over the cooled cake and let sit for at least an hour, before inverting into a plate and garnishing with powdered sugar and orange zest. Wow.. just looking at the pictures I can see how dense and moist the cake must be.. excuse me as I go get a towel to wipe the drool from my keyboard.. This sounds great - I'm not a cake fan because I don't like the light and fluffiness... so I may just have to try this recipe out. Totally intrigued. Sweetened condensed milk is good stuff. Oh yum, that sounds like a seriously good cake! I made this yesterday and it's fabulous! The amount of syrupy cake soak seemed excessive at first, but I let it sit for hours and it soaked most of it up. It would be a delicious summer dessert with fresh berries. This recipe is a keeper... thanks for posting! Hi there, I've never used orange juice, but I think it would make a perfectly good substitute for Grand Marnier! Just be sure to use the pulp-free kind, and I would maybe reduce the sugar a little bit, depending on how sweet your orange juice is.